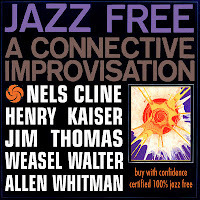 'Jazz Free: A Connective Improvisation' seems to have come out of nowhere. There is very little information about it online (as of this writing), though there is brief mention of it on Weasel Walter's website, indicating that it was to be released soon ... but with such an all-star cast of musicians, I am simply glad that it has appeared. 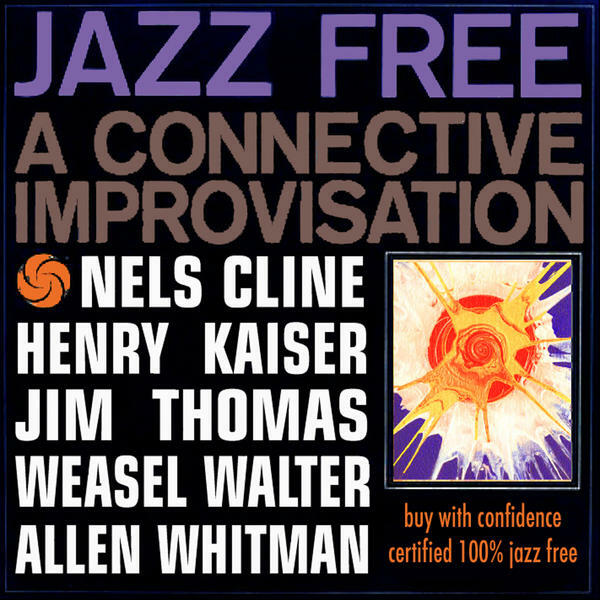 If you believe in packaging, what little there is for this album says that it's 'certified 100% jazz free', a subtle but meaningful switch of the words. The music within is improvised rock with even a bit of country twang thrown in. There are liberal sprinklings of electronics and free percussion which adds complexity and texture, but it's more or less a straight ahead improvised rock affair. With avant-garde guitarist Henry Kaiser on board along with Cline and Walter, I was expecting a more 'out there' affair, but I'm just as pleased to delve into this guitar driven jam session. Rounding out the group is guitarist Jim Thomas and bassist Allen Whitmen from the psychedelic rock group The Mermen, whose group's name is a reference to Hendrix's "1983, A Merman I Should Turn to Be." This aspect is probably most descriptive of the type of music that this session produced. I wouldn't classify this one as groundbreaking, but it's a hell of a lot of fun and there are some really great moments of synergistic blistering and bliss. I would not doubt that this album is the aural stepping stone that some rock listeners need to suddenly find themselves possessing the urge to delve further and further into the unknown. Available through eMusic, iTunes, etc. Wolfram Trio’s opening statement is also their longest. In just over six minutes, the trio unfurls the first of ten short blasts of their tense, knotted brand of free improvisation. 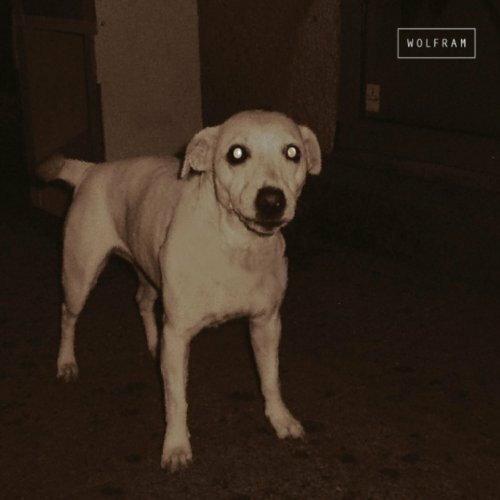 Wolfram is the group’s debut album, and the touchpoints are easy enough: punk rock, 60s free jazz, maybe even the ambiguous, churning energy of Norwegian black metal. Much like Brötzmann in his younger years, the group seems to function at the very threshold of chaos, tersely handling each idea before restlessly pushing forward. The resoundingly youthful appearance of saxophonist Halvor Meling, bassist Fredrik Luhr Dietrichson, and drummer Jan Martin Gismervik is worth noting. Despite their fresh faces, the three have been playing together since 2008 and sport a relatively mature sound that in many ways sums up the current state of improvised music. 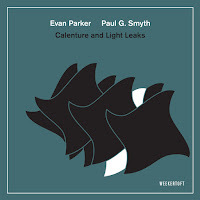 Their style can evoke the British greats: Evan Parker and John Edwards often come to mind. Fellow Norseman Frode Gjerstad, who produced the album, must also see some of his own frenetic energy in the group. Wolfram Trio are often noisy, pushing beyond notes and beats into pulsing clouds of sound. Meling has a rough, searching tone that can be more like a menacing vocal extension than a musical instrument. But Wolfram is not without its hushed moments, too. 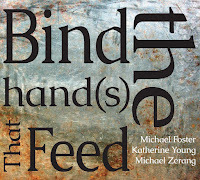 Tracks five and eight illustrate an understanding of the uneasy weight that can be implied through space and silence. Wolfram is an exciting debut. Young and eager, the band has already indicated their next offering will be released later this year. Clearly they’ve spent a lot of time studying the maps laid down by generations of improvisers before them. And now, it’s just as clear they’re headed toward the dark perimeters, and the places that have yet to be illuminated. 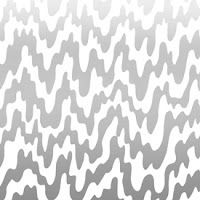 Wolfram is available through emusic among others, or can be streamed on Spotify. Early last year, Jooklo Duo released a 7” record (“The Warrior” on the Northern Spy label) consisting of two bite-sized blasts that were, if not refined, then at least condensed representations of their unique take on the duo lineup. The format lent itself to the idea that Virginia Genta (tenor sax, mainly) and David Vanzan (percussion, mainly) could lean into the noise-rock realm as readily as it had previously under the free jazz model. In June 2011, the Italian duo toured the U.S. with NYC avant-noise guitarist Bill Nace in tow, furthering the sonic possibilities of their foray into snuff jazz. In that same month, evidently before they set out for the boonies and burgs of the U.S. - (I saw them in Lafayette, Indiana!) – they recorded “Scratch,” an LP limited to 350 copies on multi-colored vinyl, which is a very fine representation of their stateside summer onstage collision course. Trust me; this is not merely a buy-and-file-away collectible record. The trio opens with a blast that is both open to any and all musical possibilities and compressed with tightly-wound energy. When Vanzan drops out about halfway through the first side, there is a short moment of metal machine music from Genta and Nace, and then all three somehow manage to elevate the intensity, while eventually Genta emerges from the flames playing ecstatic Pharoah-type figures. Side 2 opens with a continuation of the firestorm, inconceivably ascending to even crazier heights, before the splatter percussion drops out and Genta belts out insane pterodactyl shrieks from her sax. Suddenly the whole thing opens up, with Vanzan – playing beautiful mallet percussion – doing a short duet with Nace before a brief moment of Genta’s bamboo flute comes floating overhead. Then suddenly she picks up the sax for some gorgeous runs dripped in occasional multi-phonics. The storm finally clears with Vanzan’s gentle mallet work, Genta on melodica, and Nace gently bowing the guitar strings. Then Vanzan picks up the flute and all three swirl around in a fog that sounds a bit like the Sun Ra Arkestra’s take on a Nino Rota score. It becomes more airy as it goes, leaving the trio to play the spaces as much as the instruments. A surprising coda appears with Nace punching in some reverb and strumming an open chord, followed by Genta on bombarda. Then the finish: Nace playing percussive figures on the treated guitar, while Genta’s figures spiral above and Vanzan’s mallets swagger until resolution – which sounds to these ears like the attainment of intuitive nirvana. Fire! with Jim O´Rourke: Released! -- Looking from a different perspective? As you can imagine we (the team) all get to hear the same records, and who reviews what basically works out as 'whoever fancies writing a review .... is welcome'. This of course means that you can get beaten to the post by another reviewer. As happened with me once, Stef was so interested by what I wrote he listened to the album and wrote a second review, which he then posted next to mine. It was an interesting experience to see two (more or less same) opinions, or one could say looking at the same thing from two viewpoints! Here, is a second, no third take on the 'Fire!' record with Jim O'Rourke. A short review of this small offering from Rune Records which could easily slip by without anybody noticing. This 10" EP (I think it's a very limited pressing!) with music by the undefinable Jim O'Rourke is 11 minutes of uncluttered (improvised?) music that passes you by within the blink of an eye. I'm not sure what the story behind this recording is but it's a shame there's not more of it, or at least I wonder what would of happened if they'd developed it a little further. To my mind it sounds like a sketch for a larger project which it is, and that's what makes it (for me) a slightly 'unfinished' sounding record. The group as you'll see below is a classic quartet line-up, however the music isn't easily classifiable. On 'Certainly those older and released...' (Tk1) you get to hear sampled and manipulated sounds mixed with guitar, minimal repeated bass riff and simple drum fills which develop gradually into a mournful melody played on sax which leads us out. On Tk2 'Particular local and plastic wrapped' the group builds in intensity with Gustafsson leading the troupes into battle over a repetitive bass riff with the other instruments following on gradually building in intensity, subsiding only as the sax steps aside. In fact you could sum up the basic idea of both sides of this EP as music which pulsates over a simple harmonic base. There's not much else to say about the music as at the very moment it starts to take off the track runs out, or should I say the record stops. But what is here is quite interesting, it's just there isn't much of it. I guess if you're a Jim O'Rourke or Matts Gustafsson completist you may want this one in your vinyl collection, otherwise I'd pass this one over and wait for a fully fledged recording, which I hope will materialize one of these days. The Group : Mats Gustafsson baritone saxophone, fender rhodes, live electronics, Andreas Werliin drums, percussion, Johan Berthling electric bass, Jim O'Rourke electric guitar, synthesizer, harmonica. 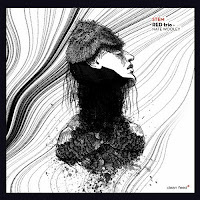 Review (March 2012) - This is Paul's take on the record. As you can see he reviewed with a bunch of other records in the Matts Gustafsson section, always a good thing (name) to start a discussion! 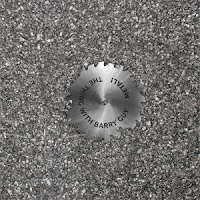 Review (June 2011) - this is a review of the original album that has the rest of the material from the above release. I hadn't done my homework and only read this review after writing mine. However, I imagined that there was more material and of course there is. Read the Review March 2011 for more info. 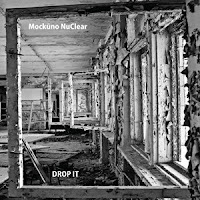 Anyone who reads my reviews on here will know that I really like improvised music and in particular when it embraces written elements - ex : Atomic, Motif, The Engines, Ken Vandemark etc. That's maybe a contradiction in words - written and improvised - but the idea that the two can possibly cohabit the same space (musically) does lead to new ideas and colourful music (*). Mockuno NuClear fall into this category sitting somewhere in-between the two ideas, trying to please both camps at the same time. This is a record which at the beginning shines like a bright star. The music is wonderfully played and (as mentioned) slides between the composed and the improvised with great ease. Saxophonist Liudas Mockunas plays some fantastic lines on the opening tracks which glide gracefully into semi romantic classical themes with the piano. It's not really clear if Prelude (Tk1) and Prelude Variation (Tk2), or Tk3, The Cursed (Prelude Variation) are actually linked musically, although one doesn't have to worry too much as these three tracks clearly hold together as one idea. In fact after hearing these three pieces I was very excited to hear what the rest of the record would reveal. (What follows) .... after the opening pieces the record almost splits into two areas, something that I hadn't counted on, and certainly not hinted at the beginning. Tracks 1, 2, 3, 5 and 8 are loose yet intimate pieces working round a more acoustic ethic, whilst tracks 4, 6 and 7 seem to be another group (although not necessarily different musicians) leaning towards groove based improvisations. Elephant Tango (Tk6) is a lovely theme, an almost semi pastiche of a tango style which bursts with energy yet seems totally out of place on the record. Track 4 - The Dark Side/The Bright Side (The Bright Side is dedicated to Andrew Hill) is another hard blowing tune, something one could imagine Matts Gustafsson playing with complete abandon. Here the group rocks away with Rhodes piano, grooving drum and bass riffing away and baritone sax in full attack mode! Great stuff I can assure you, but again a little unexpected. Finally, it's this conflictual aspect which is slightly off putting as there are several records here, all probably very good. What is audibly an excellent group with some very positive and good musical ideas seems to not really know which side to express first, in fact putting all this into one record leaves the listener confused as to when best to listen to this record. Having said that I think anyone who is curious will probably find much of interest and will also be rewarded on repeated listens. I suspect that the group seen live would be very compelling, let's hope that the next record will clarify some of their very exciting ideas. Personnel: Liudas Mockunas: soprano, tenor and baritone saxophones; Dmitrij Golovanov: piano and keyboards; Marijus Aleksa: drums; Vytis Nivinskas: bass (5, 6); Darius Rudis: drums (7). (*) = The other possibility being totally improvised, or of course the more traditional 'theme' with identifiable chord progressions used as an improvisational vehicle. 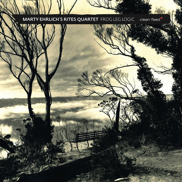 The title track from Marty Ehrlich's second Julius Hemphill inspired 'Rites Quartet' release, Frog Leg Logic, triggered a memory. It transported me back to my university days when the album I was listening to had to be louder than the one my neighbor was listening to. His music would get louder so I turned mine up. Then something magical happened. The two songs, for some reason sounded really good together, creating something new. Ironically, the separating wall provided what it took to unite them. The track Frog Leg Logic is what that would sound like. There is something so creativity distracting about Hank Roberts' cello, like he is playing a different song in another room. But it works so well. I can't stop listening to it and luckily the joy continues throughout, whether it is bowed, strummed, plucked, or when borrowing from jazz, classical, and world music. Ehrlich guides Roberts, James Zollar (trumpet) and Michael Sarin (drums) through this big jazz record. In many places it is much bigger than the sum of its parts. There is some big production with compressed drums and deep reverb. This is a big history lesson but it also carries a big flashlight to look ahead. Walk Along the Way is a lesson in deconstruction and rebirth. What starts with a walk along the countryside quickly erodes into being lost in the forest. Roberts and Sarin grab the flashlight and forge on, providing a sinister backdrop for Ehrlich to play some darker passages over as Zollar blows some wind directly into your ear. Once safety is spotted, the group compose themselves and slowly put all the pieces back together until they are all again standing on stable ground. The album takes an unexpected but pleasant turn on My Song; a duo of sax and cello. Ehrlich imitates the cello with warm tones and a convincing vibrato. Roberts returns the favor with some trills of his own. Both instruments fall into a dance of mutual respect while never becoming confrontational. Their history together is very obvious on this track. Definitely one of my favorite songs on the album. Granted, there are a few moments that are not to my taste, but these are the things that question what it is I like about jazz in the first place. It makes my want to listen to more Julius Hemphill and further enjoy Ehrlich's journey to here. For that alone, I am glad I gave this album a closer listen. 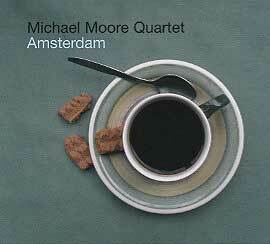 Can be purchased from Instantjazz or downloaded through eMusic. To write about solo percussion works seemed a unique challenge. At first, I was both intrigued and bit skeptical that percussion alone could sustain an entire recording, but I'm pleased to report that my prejudgements were, as most are, entirely unfounded. 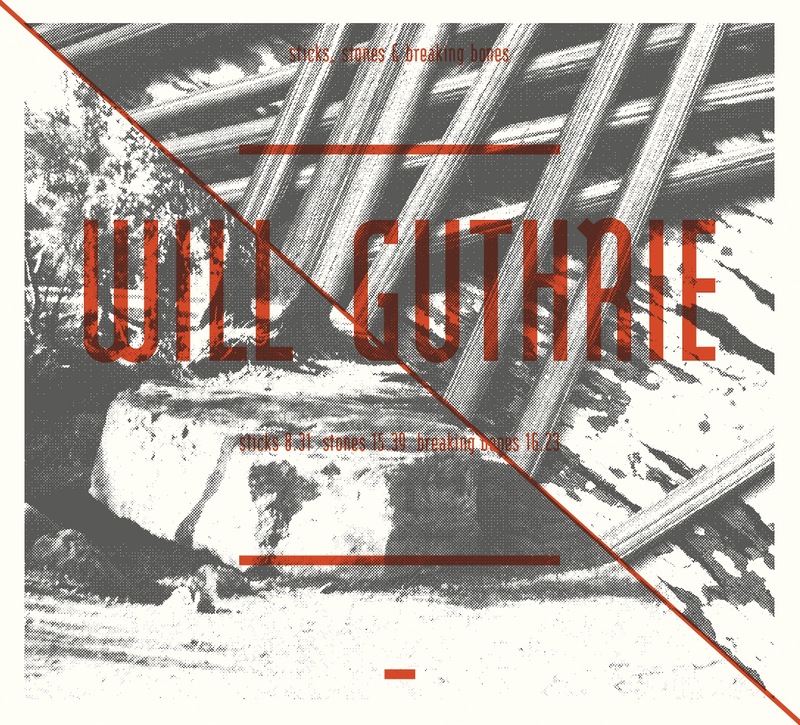 The songs on Will Guthrie's album are Sticks, Stones, and Breaking Bones, and as the names imply, there is a fragility and certain brittle dryness to the album. It begins with a clatter of percussion and quickly the rhythms and textures emerge. Hypnotic and cleansing, primitive and dense, the complex rhythms build to a mesmerizing climax during the 16 minute closer Breaking Bones. But getting to that point is a journey of space, texture and time. 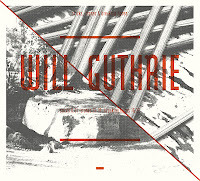 In fact, Guthrie, who is also a member of The Ames Room, decribes his music as "high energy, rhythmic, repetitive, intense, tribal, with influences as diverse as gnana music, west african pop, minimalism, noise music(s)." And it's all of that, not to mention quite resourceful and inventive too, as Guthrie runs through all the different permutations and combinations of beat patterns. Sticking to his drum kits and assorted percussion, Guthrie lays out the skeletons of the songs whose bones he starts breaking. When not working with the who's who of jazz, it seems Smith is busy inventing a new definition for solo percussion with what he calls Congs for Brums. 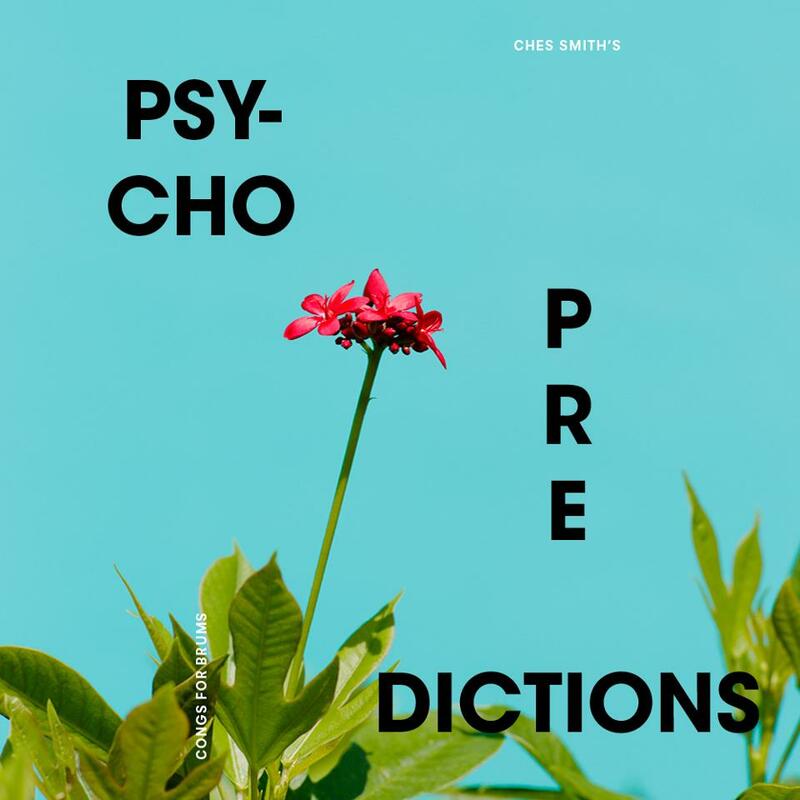 This recording Psycho Predictions is a suite like piece that incorporates all sorts of percussion and electronics. Recorded without overdubs, it runs as a series of ideas and that flow meticulously into each other. 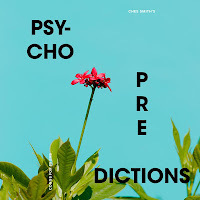 Though a solo percussion recording, Smith employes electronics and vibes along with his drums to create a range of textures and sonic interest. 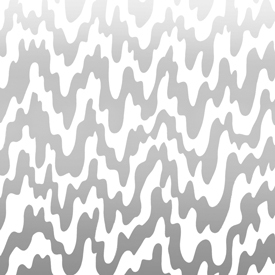 The resulting unusual mix of sounds may grate against each other or mesh in unexpected patterns. What to listen for are the internal rhythms and tones that happen between the clatter of percussion, oscillations of the electronics and shimmering tones of the vibraphone. It's a fascinating landscape that Smith paints and not what you may be expecting. Come at these two albums with no expectations but be prepared for something new. The sheer inventiveness of these albums show that 'solo percussion' can mean many things and go in far different directions. Creative, thoughtful, and again, resourceful, these are two very interesting and unusual albums. The Thing with Mats Gustafsson is that not everybody in the free music community likes his approach. When Stef reviewed some of his new albums two months ago, one of the comments added that he is just playing “loud and raucous”. Whether you are a fan or rather reluctant – listen to his new The Thing album. As usual the band is Paal Nilssen-Love on drums, Ingebrigt Håker-Flaten on bass and Gustafsson on saxophones. For this record, which was recorded at St. Catherine’s Church in Vilnius, they are backed up by bass legend Barry Guy who has also played with Gustafsson in the marvelous Tarfala Trio. All pieces on “Metal” except the last one are named after metallic chemical elements, the cover shows a saw blade in the middle of all kind metallic trash. If the more timid of you fear the worst, “Lanthanum”, the opening track of the album, might prove you right. From the very first second everything is displayed like in an exposition of a play: the main motives, the protagonists, Nilssen-Love’s relentless drumming, the two basses struggling, intertwining, pouring fuel into the fire, the musicians cheering each other on and on top of all Gustafsson yelling and howling. Yes, there is sheer brutality - but there is also absolute beauty. The key track on the album is “Europium” where you can find everything the album is about in a nutshell. It begins with Gustafsson’s baritone ticking like a clock, slightly losing its regular rhythm. It takes over a minute before the basses join in and only then the saxophone starts to cry out in an almost bluesy approach anticipating something dark deep down under the surface. Only then, after a short conversation of the two basses underlined by Gustafsson playing almost lyrical notes, Nilssen-Love starts off chasing the saxophone on a first wild ride. There is a break in the middle of the track where Nilssen-Love plays a duet only on the hi-hat with Håker-Flaten who tunes down his bass to infernal depths – it’s the calm before the storm. And then all hell breaks loose, Gustafsson’s baritone is yowling in long deep shivery cries like an animal in fear of dying just to switch to fury from one moment to another as if being ready for a final attack. But in the end, it all calms down, the ride is over and there is nothing but sadness. At this moment Gustafsson plays a heartbreaking part accompanied by drone-like and scratching basses, here you can find consolation in beauty. The piece (and the whole album) wakes a hundred sleeping memories with free music and makes them ripe and vivid again, remembering especially Albert Ayler and Peter Broetzmann. The album closes with a cover version of Lightning Bolt’s “Ride the Sky”. It is shorter and less Punk/Metal than the original. But it is incredibly tense and organic due to the atmosphere the church provides. What a way to end an album. The album is released on double vinyl only and strictly limited. Don’t hesitate. 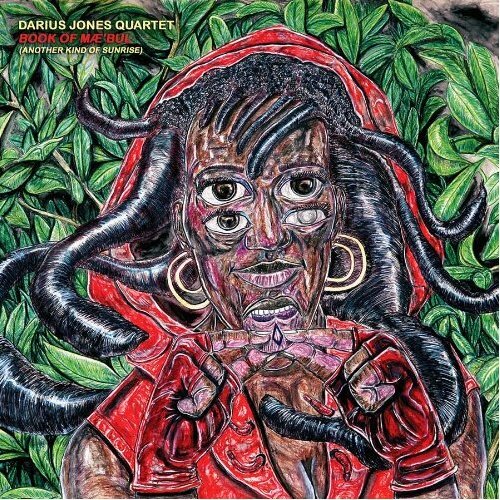 I had a dream about Darius Jones last night after listening to Book of Mae'bul. He was playing in a small club and I was the only person in the audience. When his set finished I approached him with a question. It was to help me write this review. He opened his mouth and I could hear the record, note for note, coming from inside of him, somewhere very deep. 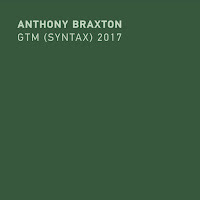 A clear statement, on this, the third installment of his Man'ish Boy series, was to switch up the rhythm section again by adding Trevor Dunn (bass) and Ches Smith (bass) who dynamically aid in Jones' maturation of themes from Big Gurl (Smell My Dream). Another is the addition of Matt Mitchell on piano, turning Jones' previous trio relationships up a notch. This decision pays dividends multiple times throughout. For example letting him be the first thing you hear. A wonderful introduction indeed. That, however, isn't the only excitement on The Enjoli Moon, the album's opening track. Mitchell also gets the first solo as Dunn and Smith propel the tempo as if they were warning us about something. An ear full of a track indeed full of push and pull, abandonment and restraint. The track Be Patient With Me starts with a gut wrenching plea for salvation, forgiveness, and of course, patience. The sax rips to the heart of the matter quickly and so effectively that I was left, as a listener, atoning for my own sins. And how about My Baby, with it's perfect spattering of honk and bash over its melody. With a title like You Have Me Seeing Red one would expect a violent anger fueled tune but he treats it with more disappointed instead, which always cuts deeper. After Dunn's captivating solo, Jones bends and rings out each note as if he was explaining something that you just couldn't understand. The band comes in weaving a map of swells and rumble only to end in a quick burst just as it began. I would be remiss if I didn't mention the recording of the album. Co-produced by Steven Joerg and Jones himself, the sound of the horn becomes another broken down barrier between player and listener as it is up front in the mix and virtually effect free. This decision requires a heightened confidence that Jones backs up. The AUM Fidelity web page describes the album as, "Music that has been purposefully designed to embrace the listener." Admittedly, Book of Mae'bul doesn't always reach for the outer atmosphere but it does very effectively sift though the dirt of the human condition, which in my opinion, is equally unexplored. An album that continuously leaves me emotionally exhausted. “Playing in a trio is very tricky for me, honestly.” In a 2009 interview for Bagetellen, trumpeter Nate Wooley describes struggling with the trio dynamic, often feeling as though someone must end up the “wild card,” running the risk of jutting awkwardly into the musical conversation. 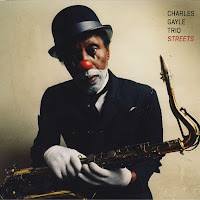 But he also goes on to describe trios in which he’s forged singular connections, groups that have settled into unspoken modes of operation that elevate all the musicians involved. 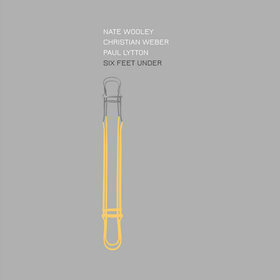 Six Feet Under, released as a very limited LP by NoBusiness Records, was recorded a few months after that interview. Opener “Pushing Up Daisies” starts quite immediately with Wooley’s quiet, bubbling lines and the gentle scraping of bassist Christian Weber. It soon establishes the dynamic that prevails throughout the record: an almost symbiotic pairing of Wooley and Weber, supplemented subtly by Paul Lytton’s clattery percussion. Often, the bass and trumpet meld into textured drones that may as well be a single sound, with Wooley’s long, scratchy tones dissolving into the arco bass. Weber is a particularly attentive improviser: he listens closely to Wooley’s phrasings and changes in timbre, often matching or highlighting them with a speed and clarity that reminds me of the great sax-player John Butcher. The black theme running through the song titles is fitting. The atmosphere is occult and abstract, especially in the quieter moments. “Moribund” drags itself along, beginning almost out of earshot—you find yourself holding your breath, trying to pick up on Lytton’s faint rattles and thumps. Close listening suddenly feels like eavesdropping. The patches of alien noise that erupt in “La Grande Morte” sound like attempts to conjure something dark and Lovecraftian. At times, it’s not at all clear who’s doing what, only that they must have some secret understanding of the terrain they’re investigating. Even at its loudest, there’s a measured quality to the music, an intuitive sense of direction that’s shared by all. Final track “Check Out Time (The End)” closes with Wooley and Lytton sputtering out static, like a radio transmission that’s being lost. 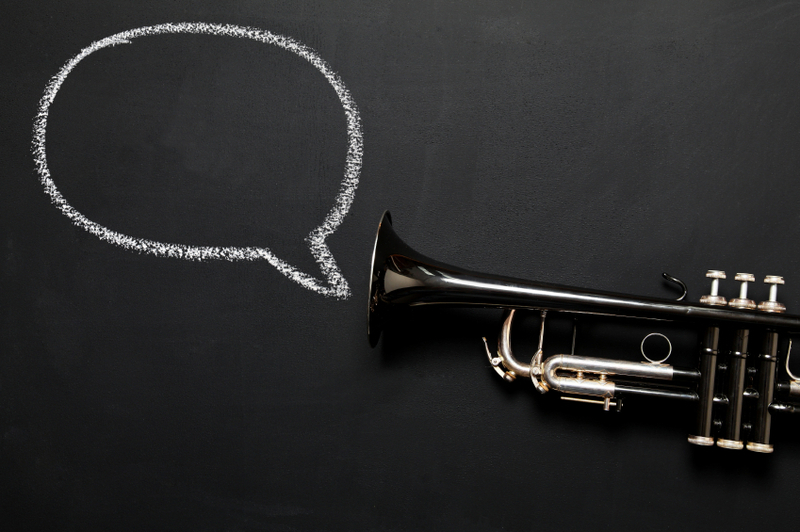 It funnels down into a sole, reedy note held on the trumpet, then expires with a click. It’s a perfect ending, and once again affirms that—despite his reservations—Wooley’s not only survived a trio encounter, he’s absolutely nailed it. 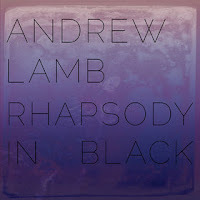 It sounds as if Andrew Lamb read my review of his previous album "The Hues Of Destiny" which was nice enough, but never really meant to make a statement. And he does on this fantastic record. He plays saxophone, flute, clarinet and conch shell, Tom Abbs plays bass, tuba and didjeridoo, and with Michael Wimberly and Guillermo E. Brown playing drums and percussion. 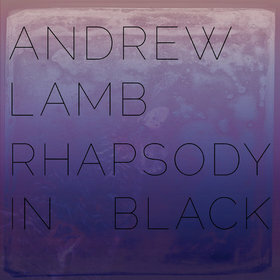 On "Rhapsody In Black", Lamb make a perfect mix between indigenous African music, post-bop and free jazz, and as its title suggests, an ode to black music in its entirety. 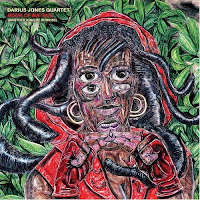 The album starts with "Initiation", a hypnotic and slow piece with lots of open textures, yet with the same tension as on Jarrett's "Survivors' Suite", with percussion and bass leading the yearning dance of the sax. The title track is again rhythm section driven, with Lamb's tenor soaring in a more uptempo way, with Abbs blowing dark toned voices out of his tuba, and even if the music looses a little bit of momentum halfway, the free improvisation moves over some military sounds to a beautiful repetitive phrase, supported by Abbs' arco playing, and the transition works perfectly. I am usually not a fan of flute music, but Lamb's intro is quite compelling on the long "To Love In The Rain (Portrait Of A Virtuous Woman), including some Middle-Eastern tone flexions, over a great rhythmic base, and the conch shell sound adds a remarkable mystic depth to the piece. The album ends with "Song Of The Miracle Lives", starting with expansive sax playing in the best free tradition, both lament and invocation, a fragile solo full of emotion and spirituality, with bowed cymbal sounds in the background offering great effects of space, and as the bass and the drums start adding pulse, so does the sax, with a repetitive rhythmic phrase, first bluesy, then playing for the stars and the universe, accompanied by enthusiastic shouts and rhythmic mayhem, yet it remains within boundaries, respectful, contained, subdued, never violent or antagonistic, but creative and fresh and sweeping. If you really want to hear soul and spirituality and human warmth, you should listen to this album. This band masters the magic of music. An album to listen to many many times. The double horn section of Volume is raw and slightly abrasive, in the best way possible. 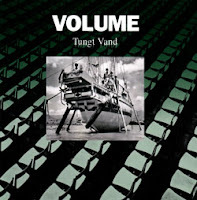 The saxophone and bass clarinet of Mikolaj Trzaska and trombone of Johannes Bauer titillate as they intertwine and traumatized as they battle it out with drummer Peter Ole Jorgensen and electric bassist Peter Friis Nielsen on the tracks of the live 'Tungt Vand'. The quartet specializes in its namesake but in much more too, taking the adventurous listener on some excellent musical twists and turns. As challenging as the sound can get at times, it seems to retains a core melodic sensibility. In some way, I am reminded of the Scorch Trio in how the group approaches collective improvisation. Space and time shape the sounds into songs. A good example is 'Megasus', a challenging tune that captures the essence of the group's approach. Starting with the distorted sounds of voices filtered through their mouthpieces, soon follows myriad scrapes, bleets and blasts. Percussive hits punctuate the atmosphere and sustained tones from the sax stretch through the sonic fog. The cacophony builds in intensity and soon the song become a dense frenetic soundscape. Snippets of melodic phrases form and dissipate quickly, often triggering other events. Over the course of eight minutes, it builds to a delightful crescendo of sound and fury, worth every moment of attention. Overall, 'Tungt Vand' is an engaging listen, its rawness and intertwining melodies can be captivating. 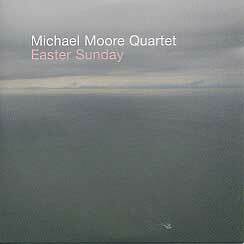 Made on a tour date in Poland in 2009, the recording sounds excellent, picking up the extended techniques and grandiose crescendos in living, breathing detail. Guitarist Mary Halvorson has appeared in several recent posts on this blog and much has been written about the fresh and exciting perspective she is bringing to the guitar, however, most of the recordings documented here are projects outside her explicit leadership. 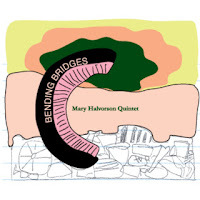 While all are excellent recordings, this latest one, 'Bending Bridges' recorded with her quintet, is an exciting documentation of her evolving style and group's playing. I had a preview peak at the charts for some of the songs when I arrived a little too late at The Stone last fall and ended up sitting behind the musicians and had a clear view of their music stands. Dense thickets of notation, like rorschach test from my vantage point, spread out across endlessly accordioning pages. I was as mystified by the charts as much as I was by the brilliant playing. It's quite satisfying to hear the music that was captured for this album. The guitar is at the center of 'Bending Bridges' and its sounds and shapes are reflected in the compositions. It is an exciting set of songs that pack a lot of changes, textures, styles and space into their fairly complex arrangements and where careful consideration and space is thoughtfully given to all the musicians. From the opening moments, there is gravitas to "Sinks When She Rounds The Bend (No. 22)". The guitar holds unusually voiced chords while the double horn line up of trumpeter Jonathan Finlayson and Saxophonist Irabagon play a slow moving melody, creating an effect like chords moving in counterpoint. Halvorson then uses single note lines, with some unexpected intervals, to bridge between quick melodies from the horns. Bassist John Hebert has an extensive solo and his interactions with drummer Ches Smith's ambient textures makes for quite a happy earful. The next tune, 'Hemorrhaging Smiles (No. 25)', is a fascinating track. From the somewhat jaunty rhythm, to the excellent solos from the horns, to the plaintive melody riding over the guitar solo, the song evolves into a distortion laden rocking affair and down in the muck free jazz exploration. The seamless blend between the free playing and composed sections seems to showcase the versatility of group and Halvorson's confident compositional skills. Another song, 'The Periphery Of Scandal (No. 23)', has Halvorson leading off with an uptempo and sinewy melody. Recorded with the core trio of guitar, bass and drums (the quintet plays on just over half of the tunes) it becomes obvious that foundation created by the three allows the full quintet to be the 'icing on the cake'. 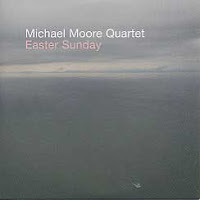 It's great to hear Smith's tumbling solo and the connection that the trio has, and when Halvorson hits the distortion, the effects are devastatingly sublime. I could go on and on, but it's suffice to say that this is a highly creative and compelling set of songs that begs for repeat and close listens. For me, each time I hear it, a new layer of sound peels away and presents itself. 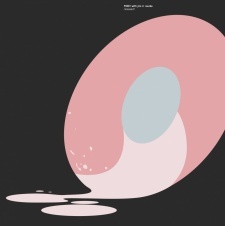 I may be going out on a limb here but there is a kinship to Tomas Fujiwara & the Hook Up's 'The Air is Different' released last week and even the recording from Aych released a few months ago. Not just because Finlayson is a member of the Hook Up and Halvorson is a member of both, but rather in something found in the approach and spirit of the work. 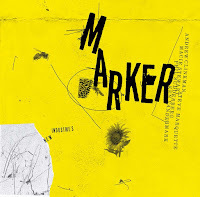 Perhaps it's just the proximity of their releases, but the blend of freedom and composition and the bricolage of seemingly opposed styles being melded with growing sophistication seems to be part of a journey to something new and exciting. More original music from the UK, and a very nice one too! The young generation of UK jazzers keep on producing refreshing new music that respects the previous generation and yet builds on newer concepts. Along with the Polish scene (a little more dark in concept) the UK seems to be capable of turning out music which is truly 'genre bending' and at the same time be also accessible. When I talk about 'these' groups I think of the new generations involved with the Loop Collective, F-Ire, the LIMA and several others on the UK scene. 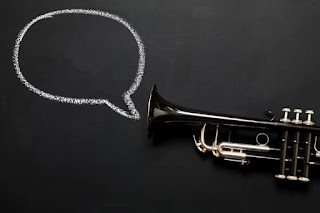 The music that is being produced seems to be happily embraced by the younger generation of jazz lovers, meaning that the contemporary music and free-improvisation scene stays healthy and vibrant. 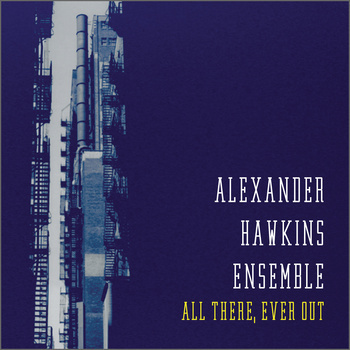 Alexander Hawkins' new offering, the second I think, with his ensemble consisting of Orphy Robinson (vibes/marimba), Otto Fischer (guitar), Hannah Marshall (cello), Dominic Lash (bass), and Javier Carmona (drums) is one of these wonderful such groups. A group that produces a music that is looking for new ways to play old forms, but that in no way compromises itself (not unlike that of Taylor Ho Bynum). To a certain extent it kind of reminds me of modern day Andrew Hill way of thinking and composing. The compositions are wonderful pieces full of melody with interesting rhythmic twists and turns. Solos glide in and out of the music so naturally, giving the listener a view into the music which needs no concentration. You'll find yourself magically transported into the piece as if on a magic carpet ride. Tatum Totem III (Tk 2) rattles away like a train out of control, but who cares it's such fun to listen to. Ologbo (Double Trio) (Tk 1) is a wonderful guitar piano melody that is so awkward it has to be heard and at the same time it has a naive beauty which is perfectly balanced. The use of Orphy Robinson's marimba work is a master-stroke in this context, giving the music a wonderful combination of rhythm and melody, his solo features throughout are a highlight every time. But then again so is everyone. Cellist Hannah Marshall plays some excellent lines and solos on this record. One such moment is a fantastic duet between Dominic Lash and Ms Marshall on (Tk3) 'Owl (Friendly)/A Star Explodes 10,000 Years Ago, Seen By Chinese Astronomers' ... great title, wonderful duet! In fact it's difficult to decide what to write about on this album as there's so much to look at (I mean listen to). Ahab (Tk5) is like Beefheart meets Dolphy meets Hill meets Monk, quite a combination I suggest (? ), and which also gives plenty of room to Hawkins himself to stretch out over a fine bucking bronco rhythm section. 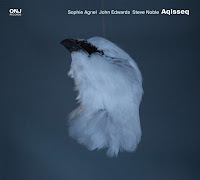 Throughout the record there is a excellent balance of improvised music, composition and even humour (I suppose) as the melodies are what could be called 'playful', all are played with energy and precision. The final track 'So Very, Know' is a stark contrast to the rest of the album with an eerie Hammond organ that finally makes way for the atmospheric guitar of Otto Fischer who gently places chords giving the piece some still movement. In fact it's not unlike standing on a beach at night looking out into the darkness at the sea wondering 'I wonder what's out there'? 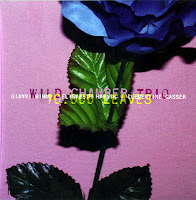 This could be one of the albums of 2012, miss it at your peril. Or if Stef was writing this ....... Highly Recommended! Their first record was a strong musical statement, their "Empire" album with John Butcher confirmed their musical vision and that exceptional power is equalled by this new album with Nate Wooley on trumpet. RED Trio are Rodrigo Pinheiro on piano, Hernâni Faustino on bass and Gabriel Ferrandini on drums. No doubt the RED Trio is among the most fascinating piano trios of the moment. Without relinquishing the real jazz ingredients of harmony, repeated patterns and rhythm, they push this over the limit of convention into a far more expressive and sometimes terrifying sonic universe. They are not afraid to dive off musical cliffs, then requiring all the energy and teamwork to fly with grace, moving forward coherently, using sonic clusters and high outbursts of violence to change course if needed, or stop moving at all, hoping that somehow they will land safely, and they do, they do. Then add Nate Wooley, the iconoclast of the trumpet, the artist whose instrument can sound as if he'd ripped it open from mouthpiece to horn before he started playing, the musician who knows how to turn sound into effect with the listener. The approach is exacerbated. The match is perfect. Whether on the great intro piece "Flapping Flight", or on the slow and mysterious second part of "Ellipse", or the fully voiced anti-rhythmic madness of "Weight Slice", or the barely audible of "Tides", ... the match is perfect, the vision is coherent, the common tone spectacular, the outcome grandiose. 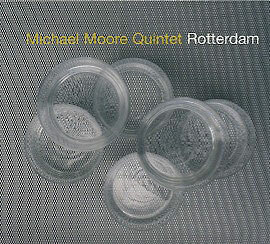 This is jazz at its very best. The opening track alone is worth the purchase. Listen how blues and bop and even romanticism are part of the language, but get distorted, intensified, turned into new levels of expressivity, in which the anguish and distress of today's life are evocated, at the same level as sweetness and beauty, of a nature that is more difficult to capture, less sentimental, but deeper, more meaningful. Scott DuBois' 'Landscape Scripture' and Joel Harrison's 'Search' were recently released on Sunnyside Records and both showcase their respective leader's guitar playing and compositional skills, however in two very different settings. While it seems that Harrison's compositions are highly detailed charts with a good deal of freedom given to the players, DuBois' seems to let the players define the shape of song. In both cases, there are references to folk, classical and a little bit of rock wrapped in a free/modern jazz approach. 'Spring Haystacks', the opening tune, gets off to a slow and probing start. 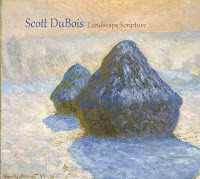 DuBois' clean-toned reverb-tinged electric guitar delivers a fragmented melody over shadings from Gebhard Ullmann's bass clarinet, while the percussion and bass provide subtle momentum -- subtle at first that is. The song builds at its own pace, then maybe about a minute and a half to the end, all the pieces snap together for the payoff. Ullmann sputters and spits along with DuBois' spare melodic knots. Underneath it all, there is a deep interlocking groove, supported by strong rhythm from Thomas Morgan's bass and Kresten Osgood's drums. 'Prairie Suite' follows, starting out with just the drum and bass about at the same tempo where the last song left off. This time, while DuBois delivers a ephemeral melody, Ullmann comes in strongly on the tenor sax. Tension drives the song and momentum is built in the friction created by the rhythm section's restraint, especially when DuBois comes in with his knotty solo. I almost feel like there are echoes of Abercrombie, DeJohnette and Holland's Gateway at points. The groups interactions are exciting and driving, building up to Ullman's high energy solo, where he employs all sorts of technique to color and energize his crackling lines. Later songs offer more pastoral and folk like leads, while others delve into free-er territory. Overall, 'Landscape Scripture' packs a lot of energy at opportune times and a good deal of economy overall. It develops slowly with intentional tension and when the energy picks up, it's riveting. Like on 'Landscape Scripture', the songs on 'Search' are brought to life by the momentum and restraint in the writing and playing. Harrison's compositions and arrangement of all the voices in his septet shows great care and precision. Yet, there is also a certain looseness. For example, this is on display as the space that pianist Gary Versace exploits to great effect on the opening 'Grass Valley and Beyond'. 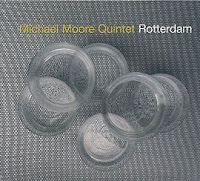 The pianist builds an internal energy that passes onto the next soloist, Donny McCaslin, and subsequently his emotive tone and lines interact fantastically with the rhythm section. Harrison's compositions provide a strong framework for the soloists to really dig into and all of the songs are interesting and complex creations. The quarter hour 'A Magnificent Death' puts the violinist Christian Howes and cellist Dana Leong to good use. The song deftly runs through several moods and feels, from the classically infused beginning to the uptempo middle section, to the swelling climaxes and the eerie spoken word section. Bassist Stephen Crump's presence is felt throughout and he locks tightly with drummer Dan Weiss in complex rhythms that take on a life of their own. Leong's cello, which is featured prominently on a reworking of the Allman's 'Whipping Post', is vibrant and aggressive . An arrangement of 20th century composer Olivier Messiaen's 'Oh Sacrum Convivium' is an interesting recasting of the classical work. Harrison, for the most part, lets his musicians have the spotlight, taking some choice solos but mostly playing to serve the compositions. 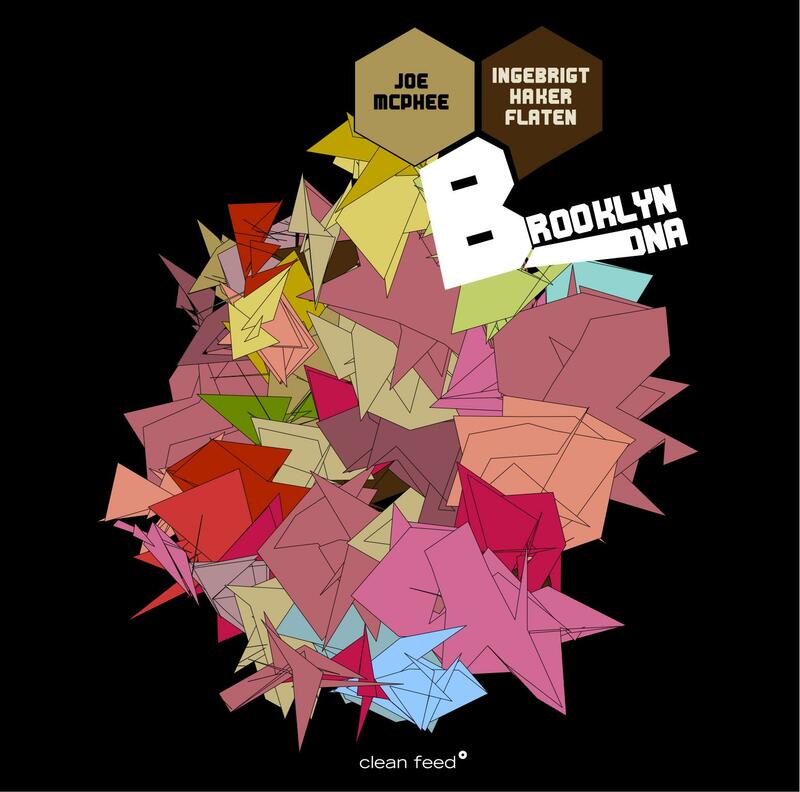 Two years ago, Joe McPhee and Ingebrigt Håker-Flaten released "Blue Chicago Blues". Like the previous album, everything is likeable and high enjoyable, yet nothing is exceptional either, in the line of what you can expect. The DNA refers to the jazz genes or sound molecules in Brooklyn's past with the titles of the songs referring to the musicians Sonny Rollins and Dewey Redman who lived there, or jazz clubs like Putnam Central and the Blue Coronet. Both musicians use these genes to reconstruct/improvise highly modern new jazz, with McPhee on sax and pocket trumpet. On a more personal note, some of my DNA is now also living in Brooklyn in the shape of my son. And on another personal note, the song title "Enoragt Maeckt Haght" is described as Brooklyn's motto coming from the Dutch. It is actually "Eendraght Maeckt Maght", and it indeed means "unity makes strength" in the old spelling and it is the motto of my home country Belgium, a country that is anything but united. To come back to the music: it's free form, rhythmic, bluesy at times, fun or melancholy, with lots of references to the jazz tradition, and played by two musicians who move alike, often in perfect sync in terms of pacing and coloring, despite the fact that everything is improvised. The most striking aspect of Tomas Fujiwara & The Hook Up's 'The Air is Different' is perhaps its fullness. 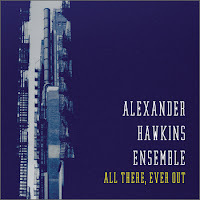 While it is essentially the same quintet that appears on 2010's Actionspeak (Trevor Dunn replaces Danton Boller on bass this time around), the compositions and group interplay seems to be more fully realized on this sophomore outing. The dual horns of trumpeter Jonathan Finlayson and saxophonist Brian Settles gives the group a lot of musical possibilities as the lead lines often twist and turn around each other, sometimes competing for the same space, other times interacting respectfully or doubling up. Guitarist Mary Halvorson lends some of her signature pitch bends and unique harmonic support, and provides some excellent leads as well, like on the aggressive 'Double Lake, Defined' and the slightly-off-but-still-stately melody of 'Lineage'. Dunn veers expertly between holding down effective grooves and adding touches of color, he compliments Fujiwara's playing terrifically. The combination of Fujiwara's compositions and musical approach really gives all the players the space and support they need to construct engaging solos. The slowly unfolding 'For Ours' features Settles working in an almost straight ahead jazz mode, with his solo punctuated by the occasional trumpet and guitar hit. 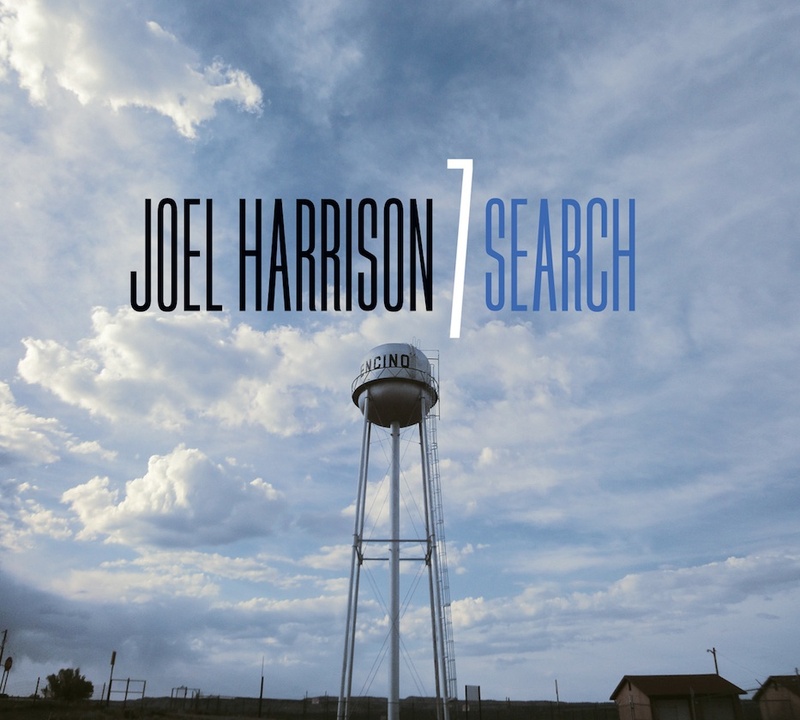 Halvorson, utilizing a natural tone, sans-effects or hitting acute tonal clusters, delivers an attractively lyrical solo. 'Cosmopolitan (Rediscovery)' begins tantalizingly with oblique snippets of sound and sonic bursts that build deliciously only to be deftly organized into a delicate melody. Another highlight is the subdued restraint of 'Smoke Breathing Lights', where the group plays with tension and restraint, delivering subdued passages until almost the eight minute mark when band leader pushes the tempo and Finlayson bursts out with a vigorous statement. Throughout, Fujiwara provides a pulse and creates the textures that pulls all the parts together. 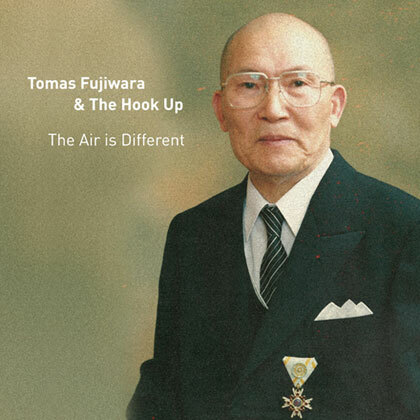 'The Air is Different' is an excellent recording from Fujiwara and The Hook Up. The group has developed a strong collective sound and the solos congeal well, blending the spirit and feel of free playing with strong compositions that play to the strengths of the groups confident, organic and melodic sound.